Finding the right animal wasn't easy. It was Camille who finally gave me the idea of being a frog! 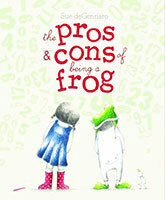 Frogboy and Camille are best friends but they are very different. Camille speaks in numbers and Frogboy likes to dress up. With Camille's help he finds that dressing up as a frog is perfect for him, but when he tries to convince his friend to be a frog too, his plan goes terribly wrong.